“Late have I loved you, Beauty so ancient and ever new. Late have I loved you. and behold you were within, and I was without.” From The Confessions of St. Augustine. St. Augustine explodes across sixteen centuries, offering us friendship. Forever friendly, he tried to be one with everyone he met. As you read what he wrote, you vibrate in harmony with his profound love. When young, he twisted natural love to dominate people. But his inner life probed his outer shell, seeking to explode beyond all limits. With Jesus, he burst loose. By accepting Christ-life, his divine and human friendships flourished. Catch a glimpse of his explosion; bask in the light and warmth of his Big Bang into the home of all friends, the Church. In our videos and texts, we echo his expansion. Though we can’t match his intensity, we can transmit some of it through English translations of his lilting Latin lessons. We may even prepare you to delve deeply into Augustine’s ocean of communication. 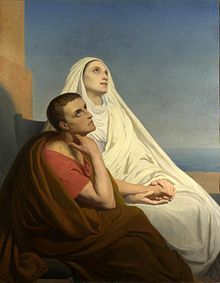 St. Augustine’s youthful positive and negative love experiences and efforts to dominate others described in his most famous work Confessions. How St. Augustine adjusted his method and developed his profession as a teacher of rhetoric. How he pursued a love of truth and took early steps toward wisdom. How adolescent adventures blinded him to the faith of his Catholic mother, Monica. His first steps toward conversion. His struggle to accept Scripture and his early prideful first rejection of it. How St. Augustine came to investigate his inner wounds in need of healing. An outline of St. Augustine’s famous book, The City of God. St. Augustine’s experience of grace and how grace operated to heal his miseries and lead to ultimate bliss. His summary of Christian wisdom in The Enchiridion on Faith, Hope and Love. His description of how God redeems and saves us in On Christian Doctrine. In Moral Behavior in the Catholic Church, and other works, St. Augustine’s teaching on how to love with God’s own love. NOTE: See also Brother Brian Dybowski’s book on St. Augustine, published in 2017 (follow the link).